Ready to cook in approximately 10 minutes. Free from binders, accelerators and other chemical additives. Less ash so easy clean up. No Need to Buy Firelighters! 2.25 Kg Approx Per Bag. Maximum 6 Bags Per Order. 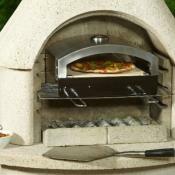 The best option for barbecues and smokers. 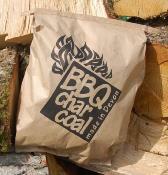 This charcoal comes from sustainable forestry and land management, made within a few miles of Rackenford Devon. Start cooking sooner, barbecue for longer and improve the natural flavours of your barbecue with this super product. 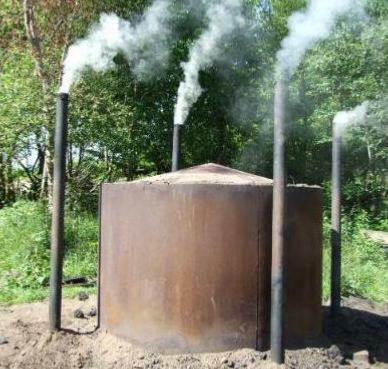 The basics of natural charcoal production is burning wood in a low oxygen atmosphere. Produced this way for thousands of years by lighting the wood and then controlling the oxygen feeding the fire by means of covering the fire with dirt, turfs or a kiln. Several different stages of the process are indicated by the colour of smoke emitted from the fire, one of which is when the moisture is driven out of the wood. 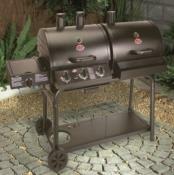 This results in the charcoal being up to 70% lighter but burns for much longer than the original wood. It looks like and is real pieces of wood. No need for firelighters, just roll up some newspaper and light it. Planet Barbecue is Proud to Supply Devon Charcoal. 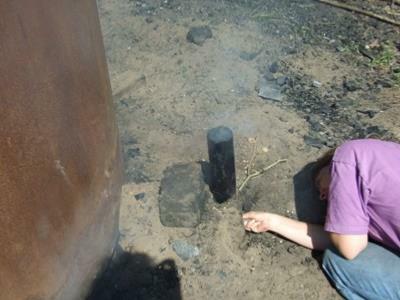 Have a Barbecue using a fuel similar to that used over 5 thousand years ago! 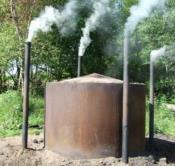 The basics of natural charcoal production is burning seasoned wood in a low oxygen atmosphere. 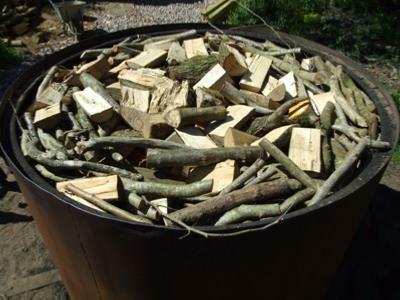 Produced this way for thousands of years by lighting the wood and then controlling the oxygen feeding the fire by means of covering the fire with dirt, turfs or the use of a kiln. The moisture content of the wood dissipates at temperatures of above 500ºC. Seasoned wood is used because of it's lower moisture content. The charcoal kiln or "retort" on the left is used at Rackenford, Devon for the manufacture of lump-wood charcoal. 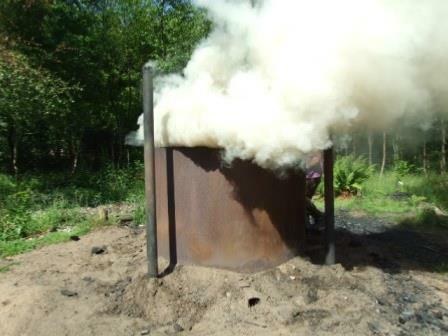 The steps of a controlled charcoal burn using a steel kiln were recorded in the Summer of 2010 at Rackenford, Devon. Charcoal Burn in Progress at Rackenford, Devon. 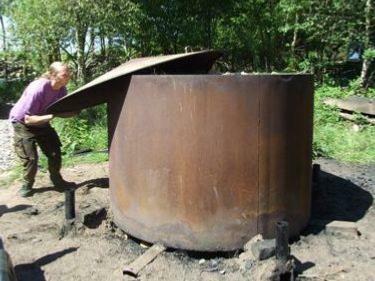 To start, the seasoned wood is laid at the base of the kiln to allow air flow and ignition at one of the 4 foot vents. 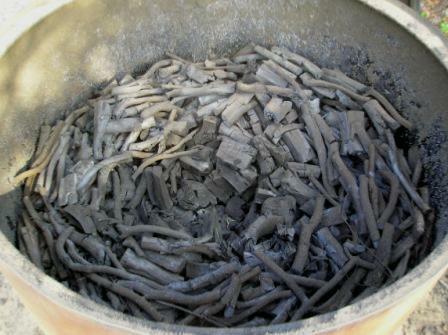 Charcoal from a previous burn is placed in the centre of the kiln with kindling to aid ignition and the first stages of the fire. 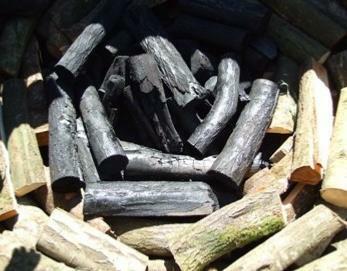 Seasoned wood is added in redials and concentric circles around the outer section which will produce the charcoal yield. Layer upon layer is skilfully placed until the kiln is full. Filling the kiln is labour intensive and hard work on a hot Summers day. 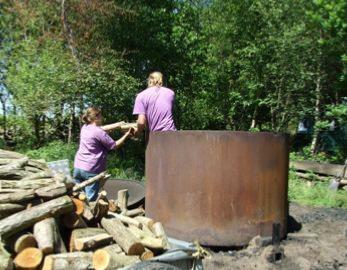 The steel kiln, now full of seasoned wood. The steel lid is placed onto the kiln. 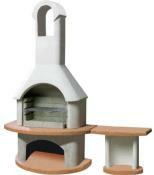 Note that the kiln is raised from the ground to maximise air flow during the initial burn. To aid air flow and draw of the initial burn the lid is wedged slightly open. One of the 4 foot vents and chimney supports which was chosen to light the burn. Lighting the kiln with cloth twined round a wooden stick. Inspecting to make sure the ignition is successful. Steam emitted from the kiln as the fire takes hold. The chimneys are ready for assembly onto the foot vent supports. Once the wood has settled and the burn has taken hold, the base of the kiln can be sealed with sand. The kiln base is now sealed and chimneys assembled in place. The kiln lid is lowed and sealed with sand. To aid a consistent even burn, the chimneys air intake can be regulated and controlled. When the colour of the steam changes to a blue tint the wood is dry and the moisture has evaporated. The kiln is now fully closed by removal of the chimneys and sealing the 4 foot vents. This staves the kiln of oxygen and prevents the wood burning to ash. At least 24 will elapse before the kiln is opened to retrieve the charcoal. After 24 hours the lid is removed to reveal a kiln of charcoal. The charcoal is then allowed to cool and removed for graded and packaging.